Schooling and Learning are often two very different things. While choosing a preschool many parents focus on the SCHOOLING factor such as: “My child SHOULD be able to interact with peers and teachers” or “My child SHOULD be able to recite the alphabet and nursery rhymes”, etc. If you flip this concept on its head and look at what the child COULD learn from his/her time in preschool, you’ll focus on concepts such as ‘developing a sense of discovery’ or ‘being inquisitive about new things’. In today’s day and age, the focus for parents and educators alike should be on empowering the young minds and not to cram lesson plans. There is a growing paradigm shift in today’s modern Early Childhood Education programs. One that moves away from ‘learning through rigorous instructions’ and towards ‘learning that is child centric’. Focus on Basics: The focus for any early childhood education setting should be to do the basics right. 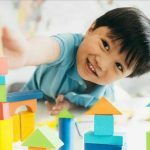 There is always going to be enough and more time for children to learn the number system or the names of Secondary colours when they get older, but the window for learning through play for a child is limited. We all know that as we grow older, we leave behind a lot of things and along with everything else, we leave behind the will to play. Child Safety: Children need an environment where they feel safe. Not just physically but socially and emotionally. Children need to feel accepted for who they are and often demand their personal space. Being exposed to an environment where the child feels the need to perform or compete on a daily basis can lead to a feeling of stress. Studies show that corporal punishment can hinder intellectual development. In other words, there is a marked correlation between spanking and a lowered IQ. The Physical Balance: Not enough emphasis can be given to the need for some extra attention on the physical development of the ‘children of the new era’. As the city life expands, the opportunities for children to run about shrinks. Children spend more time in the digital world with their tablets and TVs than in the real world of parks and playgrounds. Hence, the onus is now on the schools to provide ample opportunities for the children to run freely or even stretch their limbs. Children who spend more time outdoors are less likely to become myopic. Studies say that two hours per day of outdoor activity reduces the risk of myopia by about a factor of four. Developing the ‘Self’: The focus here is not on WHAT the child will grow up to be but WHO the child becomes as he grows up. The complex components of character- autonomy, empathy, awareness, self-esteem, assertiveness, skilful communication, and relationship competencies- are all developmental qualities. The school setting, peer to peer interactions and spending time with secondary caregivers like teachers, help in the formation as well as the strengthening of these character traits in children. Sparking Creativity: Today, people are constantly looking for something new. Therefore. Success in the 21st century depends on a person’s creativity: the ability to think out of the box, the willingness to explore and look beyond the obvious. Schools can develop such abilities by allowing the children to engage in activities which require research, problem solving, and exploration with new materials. It’s time to look beyond the obvious and DO THE BASICS RIGHT for the sake of our children. Consider the 5 factors before deciding upon the right preschool setting for your child. How do you know that your young one’s childhood is going to be a happy one?Why is it important for parents to know what kind of learner their child is?